NL 212 Half & Half "Keep the Tone- Lose the Weight"
Can't decide whether you'd like the sound of our custom made V30 voiced speakers in our normal NL212 or the Creamback loaded cab? Well fear not as we've a "half & half" cab loaded with one V30 style speaker and one Celestion G12 Neo Creamback speaker giving a tonal "match made in heaven". Sound wise you have the low mids of the V30 voiced speaker and the clarity and clear mids of the Creamback for a well rounded and full tone. It's one of the reasons whey so many guitaists are choosing the Creamback to blend in to existing cabs and making it one of Celestions best sellers. Both speakers have similar sensitivties so volumes are equally matched within the cab and the weights are similar. If you are looking for a well rounded and versatile cab thatgives a wide range of tones from cleans to rock and beyond in a cab that sounds bigger than it's size you should check out the NL212 Half & Half. The NL212 Half & Half is not an FRFR (full range cab). It's perfect for those players wishing to downsize their guitar rigs and want a to use a regular guitar cab without the weight. Ideal for guitar modelers for an "amp in the room" sound with either a solid state power amp or tube power amp as well as those simply wishing to use their existing tube head/combo or lunchbox style head and needing and light and portable cab. Matrix Amplification is pround to present the Neolight NL212 guitar cabinet. The NL212 as it's name suggests is a lightweight 2x12 guitar cabinet built in a traditional style with a modern ported design which gives a sound and feel until now only found on larger cabs. Following on from the great success of our NL12 1x12 design, we've designed a 120w 2x12 cab which can be run in either 8 ohms 120w mono mode or 16 ohms, 60w per side stereo mode. Using the same high quality, lightweight European Tonewoods as the NL12 coupled together with 2 Neodymium drivers gives a great versatile cab weighing in at an astonishing 13.5kg. Almost half the weight of the leading 2x12 on sale. 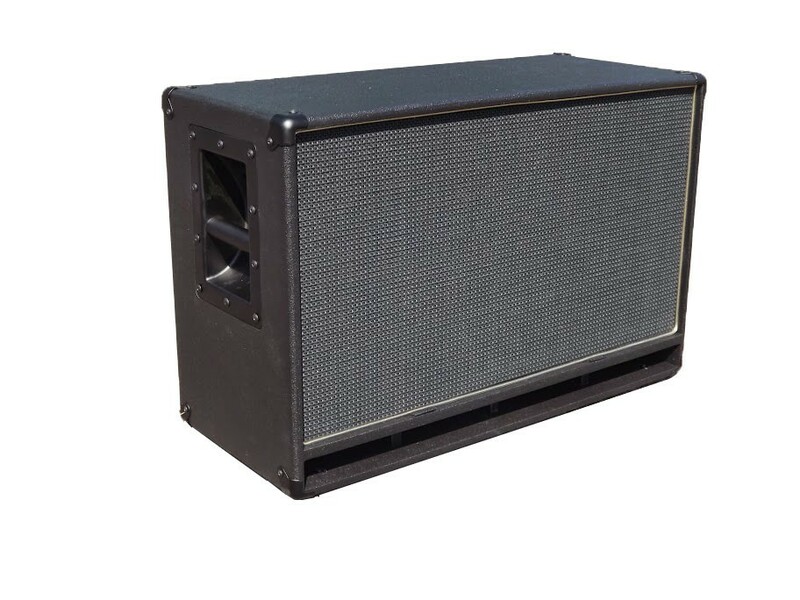 Since the early prototypes, people have been amazed at how 'big' this cab has sounded, giving 4x12 performance and "oomph" in a cab that can be lifted easily with one hand. Great bottom-end accentuated by the ported cab design with punchy mids and clear highs give a great sounding cab whether you're using it with traditional valve amps or modellers. Finished in our signature hard-wearing black textured paint finish and fitted with metal corners, this cab is built to last. A classic grille cloth and gold piping finish off the front. Neutrik speakon 1/4" combi jacks along with the stereo mono switching complete the back panel. With a cab sounding this good and weighing so little.....you just might not need a roadie anymore!